Investing in gold is a great way to diversify investment portfolios, hedge against a financial crisis, and even protect against inflation. But with so many different types of gold to buy, finding the right gold investment can be a difficult task for retail investors. Money Morning's Resource Specialist Peter Krauth is a 20-year veteran of the resource market with special expertise in precious metals and gold, and he recently gave Money Morning readers a snapshot at some of the best ways to invest in physical gold. One of the most popular types of gold investments is gold coins. There are numerous types of gold coins traded throughout the world, and they all have different weights, fineness, face values, and intrinsic values. "When looking to buy gold coins, it's usually the gold content that differentiates various types," Krauth said. Certain gold coins contain different types of metals, often copper, which add to the durability of the coin. That's why not all one-ounce (1 oz.) gold coins can be compared directly. They all may contain an ounce of gold, but they won't necessarily weigh the same. For North American investors, gold coins are usually narrowed down to the four most popular: the Gold American Eagle, the Gold American Buffalo, the Gold Canadian Maple Leaf, and the Gold South African Krugerrand. 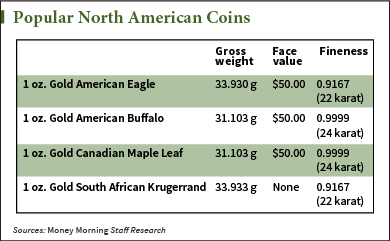 "Both of the American coins typically command somewhat higher premiums than either their Canadian or South African brethren, thanks to their level of recognition in North America," Krauth said. "Nonetheless, the Maple Leaf and Krugerrand are both among the most popular coins worldwide." Each of these coins is produced by their national mint, and all except for the Krugerrand carry a face value of $50. Those three are guaranteed by their respective governments for their content and purity. While their face values are all $50, their intrinsic value is actually much higher. Currently, the Gold American Eagle can be purchased through the Canadian metal dealing company Kitco for just over $1,372. The Gold American Buffalo is currently valued at $1,375, while the Gold Canadian Maple Leaf is $1,355. Even though the Gold South African Krugerrand has no face value, a one-ounce coin is currently worth $1,351. These coins can also be purchased in 1/10-ounce, 1/4-ounce, and 1/2-ounce amounts. Additionally, these gold coins are widely traded, meaning they can be sold easily if the need arises. No one can predict the future. I was told that the dollar would fail by 2010 a few years ago. I agree that hard times lie ahead but no one knows exactly what that will look like.